To mark the birth anniversary of India’s first Education Minister Maulana Abul Kalam Azad (observed as Education Day), a nationwide social campaign on “Right To Education” was launched here today. The state government has decided to recruit teachers through a special board and Mewat will soon get a separate cadre of teachers. This was disclosed by Chief Minister Bhupinder Hooda at the launch of the nationwide social campaign to popularise the Right to Education (RTE) Act at the grassroots level here today. INLD candidate Sarfi Bai and BJP-HJC candidate Mahabir Prashad filed their nomination papers from Ratia today. Chief Electoral Officer Sumita Misra today directed the district electoral officers of Hisar and Fatehabad to ensure strict enforcement of the model code of conduct in the Ratia and Adampur Assembly constituencies . With the Assembly byelections for the Ratia and Adampur constituencies round the corner, former MLA Rakesh Kamboj quit the INLD to rejoin the Haryana Janhit Congress (HJC) yesterday. Almost after four months after a local industrialist blew the lid off an alleged blackmailing racket being run by a local cop in connivance with four other women, the district police has arrested the complainant, Pratap Singh, on the charge of sexual harassment. The Public-Private Partnership (PPP) policy of the state government in education sector came in for sharp criticism at a three-day meeting of the Haryana Rajkiya Adhyapak Sangh (Government Teachers Association), which also gave a call to teachers to participate in the demonstration against the Pension Fund Regulatory and Development Authority (PFRDA) Bill, 2011, in front of Parliament on November 25. To keep Haryana cops fit and fine, Alok Mittal, Inspector-General of Police (IGP) of the Rohtak range, has decided to withdraw with immediate effect those policemen posted in four districts, Rohtak, Jhajjar, Sonepat and Panipat, of the range from the field duties, who are overweight with pot bellies. Office memos and charge sheets having failed to curb the connivance of officials with encroachers, engineers and officials in urban development agencies have now been threatened with police action. Detection of illegal construction activity would lead to FIRs for criminal negligence against officials ranging from JE to DTP (E), warned Deputy Commissioner PC Meena. It is a Children’s Day gift to 1.3 million children in Haryana with the state government kicking off a catch-up campaign on November 14 to vaccinate kids against measles, the deadly disease which accounts for 300 deaths in the country as against 400 global deaths daily. The four-year search of a Pakistani girl for her father who had been missing since February 17, 2007, came to end at Mehrana village of the district where she found him resting in peace in grave no. 38. Following the arrest of Pardeep Kumar, alias Bhura, the main accused in the murder case of Baldev Singh of Harewa village in the district, the police claims to have solved the murder mystery. Amidst Shiromani Akali Dal (Amritsar) leader Simaranjit Singh Mann’s call to the people for boycotting LK Advani’s Jan Chetna yatra , the BJP has made all arrangements for the arrival of the yatra here tomorrow. The state government has formulated a comprehensive scheme for industries which use and store hazardous chemicals. Under the scheme, such industries would have to prepare their separate offsite emergency plans in addition to the main emergency ones. Stepping up the anti-criminal drive in the district, the SSP, KK Rao, today asked the SHOs to initiate legal action for the seizure of the properties of those accused who had been evading arrest for the past two to three years. A former sarpanch of Dhakla village was allegedly gunned down by three villagers in broad daylight outside the village here today. The deceased has been identified as Somveer whose wife, Poonam Devi, is the village sarpanch at present. The police nabbed Gurbaj Singh alias Jagtar, an active member of the Bhindranwale Tiger Force (BTF), and his accomplice, Rupinder Singh, alias Bittu, near Nanyola village close to the Haryana-Punjab border yesterday. The police seized two countrymade pistols and cartridges from them. The police also recovered a stolen car and two fake number plates from them. The police has arrested two women in connection with explosion in a crackers godown near Baba Mastnath Giri Akhara in the Sriram Colony here on the night of October 9 in which three persons died and six others received serious burn injuries. A team of divers from the Indian Navy today recovered the body of Mohit (19) from the bed of Yamuna, about 48 hours after he was drowned. 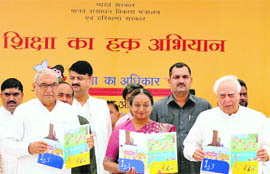 Lok Sabha Speaker Meira Kumar, Union Human Resource Development Minister Kapil Sibal and Haryana Chief Minister Bhupinder Singh Hooda launched the campaign in presence of Union Minister of State for Human Resource Development Dr D Purandeshwari, Haryana Education Minister Geeta Bhukkal and Haryana Congress president Phool Chand Mullana. The Right To Education (RTE) Act, 2009, aims to ensure free and compulsory education to students from 6 to 14 years of age. As per the Act, no fee will be charged from the children. They will also get uniforms, books and lunch free of cost. Sibal candidly admitted that the Act had not brought much of a difference at the grassroots level. As per the organisers, the campaign launched more than two years after Parliamanet passed the RTE Act aims at making people aware about their right to education. However, they seem clueless on what purpose would be served by it in Mewat (where it has been launched), given the local population’s strong mindset against getting their girls educated, government teachers’ clear preference to be posted elsewhere and pitiable educational infrastructure in the district. A news report recently published in The Tribune revealed that even fourth standard students of government schools in the rural areas of Mewat did not know how to write their names. The situation was particularly pathetic in primary schools, where the number of teachers was much less than required; and even those on duty were preoccupied in clerical, administrative, civil and culinary duties. As per the 2011 Census, the female literacy rate in Mewat is 37.60 per cent, which is much lower than the national rate. The overall literacy rate of the district is 56.10 per cent, which is also quite low as compared to the Haryana’s average of 76.64 per cent and national rate of 74.04 per cent. Curiously, the number of middle schools in Mewat is 272, which is the highest in Haryana. However, in sharp contrast, the district has only 25 senior secondary schools, which is the lowest in the state. The steep decline in the number of schools from middle to senior secondary level clearly indicates the alarming school dropout rate in the district. Hooda said the state had already implemented the RTE Act. He said in order to promote teaching of Urdu in Mewat, 550 Urdu teachers would soon be recruited. The Chief Minister presented Salman Ali of Mewat who was the runner-up in Little Champs television show with a cheque of Rs 21 lakh. He also announced Rs 2.51 lakh for students who performed in today’s programme. Dr D Purandeshwari, Union Minister of State for Human Resource Development, read out the Prime Minister’s letter addressed to students in which he had exhorted them to work hard and get a good education for a bright future. Savita Prashad also filed her nomination as a covering candidate for her husband, Mahabir Prashad while Gulab Raj, a son of late INLD MLA Gian Chand Odh, did so for his stepmother, Sarfi Bai. Besides these four, Pyare Lal, an Independent candidate, also filed his nomination papers, taking the total number of nominations to 11. Mahabir Prashad and his family has movable assets worth over Rs 1.75 crores and immovable properties worth over Rs 6 crore. He has movable assets worth Rs 81.78 lakh. His wife Savita has movable assets worth Rs 31.44 lakh while he has movable assets worth Rs 65.11 lakh in the HUF account. Besides, Mahabir Prashad has immovable properties worth Rs 89.50 lakh, assets worth Rs 1.70 crore with wife Savita and worth Rs 3.44 crore in the HUF account. He owes loans worth over Rs 1.13 crores to banks and financial institutions while his wife Savita owes loans worth Rs 58 lakh. In contrast, INLD nominee Sarfi Devi has Rs 2 lakh in her bank account, five tolas of gold and 15 kanals of agriculture land . Addressing an election rally before nominations, Chautala described the Ratia byelection as a trailer for the next Assembly elections. Sarfi Bai’s victory, Chautala said, would not only mean “exit” of the present Congress government, but also pave the way for the INLD coming to power after the next Assembly poll. Interestingly, Chautala mainly targeted the Congress in his speech and did not speak much against the HJC or the BJP except for alleging that the Congress and Kuldeep Bishnoi contested the Hisar parliamentary bypoll in connivance to defeat the INLD. When former MLA Nishan Singh asked INLD candidate Sarfi Bai to make a brief appeal to the voters, the former MLA’s widow could not speak much and said she was thankful to Chautala for fielding her. Dr Harsh Vardhan, a former Health Minister of Delhi and in charge of Haryana affairs in the BJP, said people wanted a change and claimed that the NDA would constitute the next government at the Centre while the HJC-BJP combine would wrest power in Haryana. Meanwhile, Congress candidate Jarnail Singh will file his nomination papers tomorrow, the last date for filing nominations. Hisar: Renuka Bishnoi, HJC-BJP candidate from Adampur, today filed her nomination. Six others, including Kanta Aladia of the Indian Bahujan Sandesh Party and five Independents also filed their nomination papers. Bishnoi was accompanied to the office of the returning officer by her husband, Kuldeep Bishnoi, who vacated this seat following his election to the Lok Sabha from Hisar. In the affidavit filed by Bishnoi, she has declared Rs 3.30 crore as cash in hand while her husband has movable assets worth Rs 15 crore. Kuldeep Bishnoi also owns immovable assets worth Rs 25 lakh. Likewise, Kanta Aladia has declared cash of Rs 1.5 lakh and bank deposits worth Rs 77 lakh. Renuka Bishnoi performed a havan at the Bishnoi family’s residence at Adampur before leaving for Hisar. She was received by her supporters on the Hisar bypass from where she drove to the Mini- Secretariat in a tractor which also happens to be her party’s election symbol. Her mother-in-law, Jasma Devi, widow of former Chief Minister Bhajan Lal, was also present when she filed the nomination papers. Kamboj announced his decision to rejoin the HJC after Jasma Devi, wife of the late Bhajan Lal, went to his house here, to do so. Once a staunch loyalist of former Chief Minister Bhajan Lal, Kamboj had won the Assembly elections from Indri on the Congress ticket in 2005 and joined the HJC when Bhajan Lal floated his political party. He lost the byelection as the HJC candidate to Bhim Singh Mehta of the Congress in 2008 and left the HJC to join the INLD on the eve of the 2009 Assembly electionsbut was not given due weightage. Jasma Devi welcomed Kamboj back into the party. Pratap Singh had reportedly complained against SI Pratap Sharma, accusing him of extorting Rs 1.5 lakh from him after getting a false case of sexual harassment registered against him. The matter came to light after IG, Rohtak range, V Kamaraj, asked DSP Virender Vij to look into a complaint by Pratap Singh, in which he accused the in charge of the Sector 29 police post of extorting money from him. According to the complaint, Pratap Singh alleged that on March 19, Sunita Sharma called him on his phone and stated that two women had got a sexual harassment case registered against him. Pratap Singh said Sunita also told him that she could save him from any legal action if he paid her Rs 5 lakh. Later, fearing social stigma, the industrialist had paid the women Rs 1.5 lakh on the premises of the Sector 29 police post in the presence of the SI, who demanded the same amount himself from the industrialist for forgoing legal action against him. But later, through RTI, he got to know that no case was ever registered against him and he reported the matter to the IG. In his inquiry, the DSP had found substance in the complaint, following which the district police booked the SI and four women on the charge of running a blackmailing racket in the city in which businessmen were forced to shell out money by getting them involved in false cases of sexual harassment. The matter was taken up by the Punjab and Haryana High Court, which had ordered the arrest of the SI and the four women, Kamala Kashyap, Poonam, Joyti, Shaina Mirza and Saroj Saluja. However, the police then shifted its focus from the accused and started investigating the involvement of the industrialist, Pratap Sharma, in the case and later found him to be involved in it and booked him. The police, while confirming his involvement in the sexual harassment of the women, said that he had been arrested and produced before a local court which sent him in judicial custody. The sangh, which began its three-day meeting to discuss "qualitative" improvement in education lashed out at the government for introducing the PPP model in education and said it would affect the quality of education. Addressing the meeting, Rajendran, president of the All-India Federation of School Education, made a scathing attack on the government for adopting the PPP mode in education and said 60 lakh teachers across the country were agitating against the policy of "privatisation" and "decentralisation" of education. Dharam Vir Singh, president of the Haryana Sarv Karamchari Sangh, dubbed the policy of privatisation and globalisation as "anti-workers", affecting the growth and development of the country. As many as 529 elected delegates from 116 blocks of 21 districts, representing 34,121 teachers are participating in the meeting. Executing the decision, the IGP has sent as many as 72 pot-bellied cops of all four districts to Police Lines of their area during the past few days for a rigorous physical training programme, which includes regular workouts at gyms. It is learnt that among them 27 cops are from Rohtak, 20 from Sonepat, 14 from Panipat and 11 from Jhajjar, against whom action has been taken by the IGP so that they could ensure their physical fitness by joining compulsory physical workouts at the police lines. These policemen range from constables to ASIs. Confirming the action against pot-bellied cops, Mittal while speaking to The Tribune said SSPs of all four districts had also been asked to carry on the process of identifying more overweight and pot-bellied cops of their area concerned so that they could also be sent to the Police Lines after withdrawing them from field duties. “The move aims at motivating the cops to work out for maintaining their physical health as a recent health survey has revealed that unhealthy eating habits and unscheduled duty hours have been taking a toll on the health of police personnel in Haryana. The survey also disclosed that overweight cops not only have developed ailments like blood sugar, hypertension and high blood pressure but also have a lax approach towards their duties,” said Mittal. Physical fitness is much required for those cops who are deputed especially at nakas and traffic control points where persistent movement is needed to check the vehicles and ensure proficient traffic management as well, said the IGP, adding that physical fitness also infused positive energy which helped the cops in discharging their duties in an efficient manner. “A special health programme will be introduced in the Police Lines to make the overweight cops physically fit. It will include physical training sessions in the morning and evening, special lectures on diet, counselling by doctors, games like volleyball and yoga sessions as well,” said Mittal, adding that those cops would be reassigned the field duties, who would reduce their weight up to the mark. He was presiding over a meeting of the District Task Force for removing encroachments. Meena made it clear that unauthorised constructions in the district, whether it is within the 900-metre radius of the Ammunition Depot or within the 30-metre restricted area along scheduled roads or anywhere else, since the entire district has been declared as a control area. He ordered the tehsildars not to register the sale-deeds of the plots in unauthorised areas or such illegal colonies. “If any tehsildar does so, he will be held responsible for it,” he maintained. The DC informed that the SDMs had been given powers of Director, Town and Country Planning, Haryana, under Section 9 and 12 of Act no. 41 of 1963 and Section 10 of Act no. 8 of 1975, according to which they can take suo motu action against unauthorised constructions. He directed the Executive Engineer of PWD (B&R) to submit an action plan within 15 days for removing those illegal constructions in the 30-metre area of the scheduled roads which had not been regularised up to January 3, 2009, as per the policy of the state government. Soon after joining as the new HUDA Administrator here, Dr Praveen Kumar had also asserted that since issuing memos and charge-sheets was not found to be effective in containing corrupt practices in the department, he would get FIRs lodged against corrupt officials and have them arrested. Navraj Sandhu, Principal Secretary, Health, said 1.3 million children would be vaccinated against the disease in six districts-Bhiwani, Narnaul, Panipat, Rewari, Rohtak and Sonepat. As many as 16,100 immunisation sessions had been identified of which 5,614 will be in schools and 8,534 in the outreach sites, officials said addressing a workshop ahead of the special campaign. The campaign would formally be launched by Rao Narinder Singh, Health Minister, at Narnaul, and Kuldeep Sharma, Speaker, and Ram Kishan Fauji, Chief Parliamentary Secretary, at Bhiwani on November 14. Meanwhile, experts said despite safe and affordable availability of vaccine for tmeasles, the deadly respiratory disease is taking a heavy toll. Experts advocated a holistic approach to tackle measles which had assumed alarming proportions in the population up to five years of age. Dr Rakesh Bhardwaj, president of the Haryana state branch of the Indian Academy of Pediatrics (IAP), hoped that deaths due to measles could be significantly reduced with the collaboration of the government and NGOs. Dr Suresh Dalpath, Deputy Director, Child Health and State Immunisation Officer, appealed to the general public to bring children for immunisation so that the mortality rate among the children could be brought down. Rahila Vakil, of Fajibabad in Pakistan, had been looking for her father Mohammad Vakil, who had come to India to meet his relatives in Bhasani village in Muzaffarnagar district in Uttar Pradesh on February 14, 2007. From there he left for Pakistan on February 17, but reportedly went missing. Unmindful of the fact that her father could have been killed in the Samjhauta blasts on the night of February 18, Rahila continued to believe that in all probability, he was arrested by the Indian security agencies and put behind bars. Thereafter, she wrote letters to more than 60 jails across the country seeking information about her father, who had last spoken to his family in Pakistan a day before he went missing. In the meantime, her relatives in Muzaffarnagar ascertained that Mohammad Vakil boarded the fateful Samjhauta Express. Following this Rahila got in touch with a local lawyer Monim Malik and sought his help. Momin on his part secured information from the National Investigating Agency (NIA) about the identity of the Pakistanis, who had been buried as unidentified at the Mehrana graveyard. This information revealed that the body in the grave no. 38 had been identified as Mohammad Vakil and it had been proved through a DNA test. Malik said he had conveyed this information to Rahila, who was now trying to secure a visa to visit her father’s grave in Mehrana. Mitesh Jain, SP, Yamunanagar, said the main accused in the Baldev Singh murder case was arrested by the CIA team from Nakud village in Saharanpur district on November 10 at a special naka laid near the village. A case in this connection has already been registered at Chhachhrauli police station. On September 20, 2011, Baldev Singh along with three of his relatives was going for a court case hearing at Yamunanagar. They were accosted in Harewa village by some gun-wielding persons who opened fire in which Baldev Singh died on the spot while the other three were injured. In January 2010 Baldev Singh’s younger son, Harpreet, was arrested for his alleged involvement in the murder of a youth of the same village. He was among the five persons arrested by the Yamunanagar police and is currently lodged in the Ambala Central Jail. Sources said Baldev Singh had written letters to the President, seeking permission for his family members to commit suicide. He had pointed out that 12 members of his family were under constant threat had sought security. He had also sent letters to the Haryana CM and the National Human Rights Commission alleging threat to his life. The BJP veteran will address a public meeting at Town Park in Sirsa after the arrival of the yatra around 7 pm tomorrow. Advani will stay for the night here and proceed for Dabwali the next day. Before coming here, the yatra will halt at Fatehabad in the afternoon tomorrow, where Advani will address a meeting in the Auto Market there. Meanwhile, SAD (Amritsar) president Simranjit Singh Mann today called upon people to boycott the yatra in Punjab and Haryana. Mann alleged that the Congress and the BJP were equally responsible for atrocities against minorities in India. He said if the Congress committed atrocities against Sikhs, the BJP was responsible for excesses on other minorities. An official spokesman said here that this offsite emergency plan would be monitored by the district administration so that immediate relief measures could be undertaken in the case of any accident. He said the district calamity group, under the chairmanship of the respective Deputy Commissioners, would also be constituted in all districts to review the offsite emergency plan. While addressing a meeting of the police officers here, the SSP said such criminals would neither remain the owners of the property with the help of their relatives nor would succeed in evading arrest for long. He also asked them to ensure that high- quality CCTV cameras were installed at petrol pumps, ATMs, hotels, banks, dhabas and jewellery shops by the owners and the footage of these cameras was preserved at least for 15 days. Expressing concern over some of the cases of issuing of mobile phone numbers on fake identity proofs, the SSP warned that strict action, including registering of a criminal case, would be taken against the issuing authorities. The mobile phone numbers issued on fake identity documents were being used in criminal activities. Old enmity is believed to be the reason behind the killing. The Salhavaas police has registered a case of murder against three youths of the same village on the complaint of the deceased’s uncle, Mahender Singh, in this connection. The incident took place this afternoon when Somveer was returning to his home after attending a function at the government school in the village. The accused allegedly opened several rounds of fire on Somveer from a close range and fled on a motorcycle after perpetrating the crime. In the evening, the police handed over the body of Somveer to his kin after a postmortem. Sandeep, his brother, Vikas, and Sudeep, all residents of Dhakla village, have been booked various sections of the IPC and the Arms Act. They were produced in a local court today which remanded them in police custody for six days. Ambala DCP Shashank Anand said a case under the TADA Act was registered against Gubaj Singh in Kurukshtera district. The arrested women, Afsana, wife of Sajid, and Rayana, wife of Wajid, of Ghadi Pukhta, were produced in a local court and remanded to a 14-day judicial custody. The police said the entire family was involved in manufacturing of crackers, which were illegally stored in a godown in a residential area. A first-year BTech student of Mahawatpur village, Mohit fell into the river from a boat on Wednesday, after he lost balance. His cousin, Bijender, and friend, Devi, were also in the boat at the time of the accident. According to Devi, the deceased fell into the river where the water current was strong. Residents of Mahawatpur and the district administration made a number of futile attempts to trace him. Help from the Indian Navy was finally sought. The team traced the body in the river, about 200 yards from the bank, this afternoon.